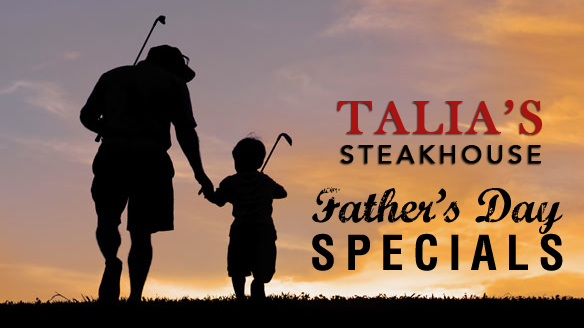 Celebrate honoring fathers and fatherhood at Talia’s Steakhouse and Bar! Talia’s Steakhouse, one of the premier Glatt Kosher restaurants in Manhattan, NYC, offers amazing and affordable prix-fixe brunch and dinner menus. Let your dad enjoy a cocktail or a homemade hot chocolate souffle with vanilla ice cream! Serving brunch from 11AM until 3PM, followed by Dinner Service. It will be a meal he will never forget! Large outdoor cafe available weather-permitting. Cocktail Menu and Drink Specials For Dad – Click HERE. Fathers get a special treat! Enjoy a draft beer on us! Menus subject to change without notice. Limited a la carte menu available.